Mayme Kratz was born in San Diego County, California and has lived in Phoenix since 1986. Self-educated and focused on her creative life at an early age, she apprenticed with artist James Hubbell in her early twenties. Solo exhibitions include: The Tucson Museum of Art and The Tacoma Museum of Glass; as well as group exhibitions at the Scottsdale Museum of Contemporary Art, Phoenix Art Museum, and Blue Star Art in San Antonio, Texas. Her work is in many private and public collections throughout the United States and has recently been acquired for the new MGM Grand City Center Collection in Las Vegas, Nevada. Smith: The natural world plays a crucial role in your work; specifically, the way you encase, preserve, and even exalt it. Is this a theme you were interested in from the beginning, or is it a theme you worked your way toward by refining your approach and craft? Kratz: I have come to realize that how we play as children is a key as to what our gift to the world might be. Sometimes this is difficult to recognize and often just a thread is what leads us to a larger realization. I was raised in a rural area and most of my play time was out in the field. Days were filled with hiking and building tree forts, fishing, and tending garden. Very early on I took on the role of attempting to mend injured wildlife I would come across. Sadly, many birds and small rodents and fish never survived. I would bury them with an elaborate ceremony. A few weeks after I’d start to wonder if they were really dead, if I might be able to see their spirits. I would unearth them out of their shoe box graves, looking for the soul, only to find various levels of decay. This close internal looking instilled in me a reverence for nature… In many ways, I think my work is an extension of that time. I am still burying things and digging them back up. 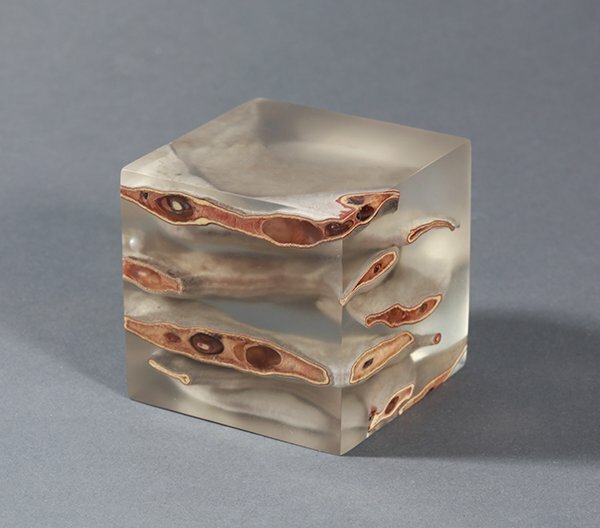 The resin taking on the role of soil, translucent and filled with light. Smith: How did you come to resin as your primary medium? Kratz: When I was a child I would collect pitch from the pine trees and warm it in the sun. I would put my most treasured bits inside the pitch, such as tiny bones and small wings. This memory stayed with me. In my search to find a material similar to pine pitch, a friend encouraged me to use resin. I resisted because of the toxic issues, but in the end, it was the perfect medium. Smith: Your wall pieces, like your sculpture, are of resin. 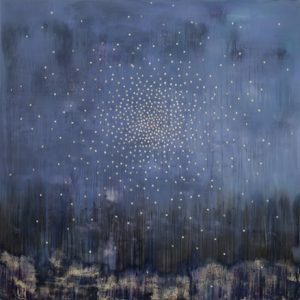 Yet, there is a distinct painterly feel to many of them, as in “Unknown Sea.” How is the resin handled differently in the two-dimensional, allowing for a different effect? And what might inform your choices— for instance, why did you choose to work the shells in “Unknown Sea” into a wall piece rather than perhaps one of your cubes? Kratz: I have always created work that is both two-dimensional and three-dimensional. I also feel it has been important for me to go from very intimate pieces to large-scale installations. Because of this I never get stuck in one place. The resin I use for wall panels is different in its chemical nature than the resin I use in the sculpture, so the results are not the same. I often create cubes that contain the same organic bits that are in the wall panels. The shells encased in “Unknown Sea” were also cast in a block, but because of composition they may not appear the same. I feel like the blocks are often a closer view of the objects in the panels…a micro view of a larger landscape. Smith: Your work dwells in the difference between forms: synthetic vs. natural, hand-crafted vs. found, idealized vs. organic. To me, your work locates a synthesis between these, not tension. Do you view them as reconcilable? Similar? Or are they forever at odds? Kratz: I do not see them as similar but more like a marriage of opposites, as if they need each other. Somehow it works. Often the materials are at odds in the making process, especially in the sculpture, but the tension creates a beauty and mystery that I cannot control or predict. The materials seem to have a poetry of their own when combined. Smith: Your pieces are both beautiful and alienating: beautiful in the way they re-contextualize and defamiliarize us to everyday detritus, yet alienating in how they sever, suspend, and expose them. Can you speak to this dichotomy in your work? Kratz: I think my pieces are like life, like nature. To use your words, beautiful and alienating. Life in the natural world is harsh. In my wanderings, I am always finding extremes…the exquisite and the awful. Smith: Then there are your installation pieces, entire departures from the resin. How did you come to this departure, or do you see them as a natural outgrowth of your work? Kratz: I do not see them as a departure, rather an extension of the same vision. It has been important to me to not be identified by a material. Several residencies, one at Pilchuck Glass School and the other at the Tacoma Museum of Glass, gave me the opportunity to work with glass and bring my vision to that material. I also work on paper from time to time and have created several books, along with poetry. Although I am best known for my resin work, I am always experimenting with other materials. Smith: You initially apprenticed with James Hubbell—an experience evidently indelible. How does that experience as a budding artist perhaps still inform your work today? Kratz: James Hubbell taught me to be fearless in regard to the use of materials. I also came to understand that nothing was a mistake, only a learning process, and sometimes a gift. How work is crafted was very important. Poor craftsmanship will call attention to itself and interrupt the message in the work. As a young artist, while working with James, I realized that I was committing to something much greater than myself and the demands would be without question. Smith: With nature so much under assault in this era, do you see your works as somehow addressing this issue, politically or otherwise? Kratz: To know and see many amazing things disappearing is something I cannot ignore. I witness the changes in my walks in the nearby mountains. I don’t approach my work in a political way, instead I tend to focus on the beauty of the natural world. I attempt to create works that have a reverence and celebrate the cycles, even extinction. There is sadness in this loss, which creates longing, and that becomes part of the work as well. Smith: What are you at work on now? Kratz: I have a solo exhibition opening in San Francisco in December. Most of the work is inspired by a poem titled “Distances” (see below). After that I plan on hitting the trail and exploring many favorite Arizona wilderness areas. We have a huge bark beetle infestation and I am considering an installation using fallen trees…thinking of creating a ghost forest. Swifts turn in the heights of the air;higher still turn the invisible stars.